Currently, the most important cause of death is cancer. To treat the cancer there are a number of drugs existing in the market but no drug is found to be completely safe and effective. The toxicity of the drugs is the key problem in the cancer chemotherapy. However, plants and plant derived bioactive molecule have proved safe and effective in the treatment of cancers. Phytochemicals that are found in fruits, vegetables, herbs, and plant extract have been usually used for treating cancer. It has been established that several herbal drug have a strong anticancer activity. However, their poor bioavailability, solubility, and stability have severely restricted their use. These problems can be overcome by incorporating the herbal drug in nanolipolomal vesicles. In last few decades, researcher have used herbal drug loaded nanoliposome for the treatment and management of a variety of cancers. Presently, a number of liposomal formulations are on the market for the treatment of cancer and many more are in pipe line. 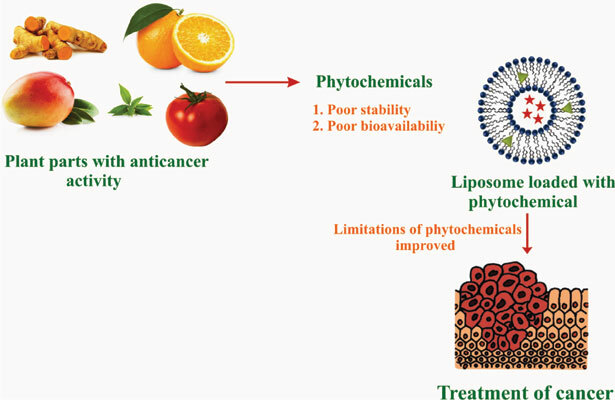 This review discusses about the tumor microenvironment, targeting mechanism of bioactive phytochemicals to the tumor tissue, background of nanoliposome, and the potential therapeutic applications of different bioactive phytochemicals loaded nanoliposome in cancer therapy. Flavonoids, bioactive, phytochemicals, nanoliposome, cancer, tumor microenvironment.